The slogan of New Terrain Brewing Company isn’t limited just to those who explore the great outdoors—though it certainly does include outdoor adventurers. Accordingly, visitors of the Golden, CO-based brewery are rewarded with a spectacular view of the Foothills; in addition to effortless access to a forested dog park. 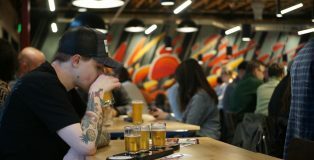 This facility, with its bucolic beer garden that offers scenic sights of Rocky Mountains to the west and Denver’s skyline to the east, was certainly built with those who wander outside in mind. 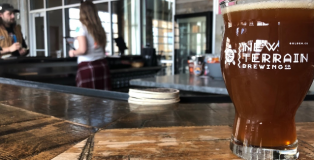 It’s not immediately clear where Adamant Brewing and Blending, tucked deep into an industrial pocket of North Boulder, is among the dozen or so nondescript cement facades in a lot full of warehouses. But beneath a black awning, next to a small, yellow Brewers Association sticker in the lone window guarded by black bars, lies Boulder’s newest brewery and the “cousin” to VisionQuest, a brewery borne from a homebrew shop on the East side of the city. 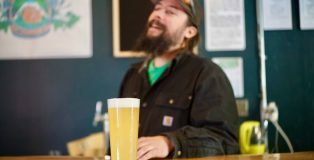 Adam Kandle, co-owner and co-founder of both, calls VisionQuest the cousin, and not sister, because breweries know no gender.